I feel as if “democracy” is an interesting concept because I recognize a huge divide in how it is discussed by academia and the general public in the United States. While academia is willing to challenge and discuss the boundaries of democracy, it seems to me as if these conversations are not only non-existent in the general public, but are also discouraged. I remember once that I was explaining some of the problems of our democratic system to my grandmother. She took it upon herself to interrupt me and proceeded to gently lecture me (in a style very reminiscent to the Cold War) about how our democracy is the best system on earth and anyone who doesn’t agree has socialist beliefs. I find this discrepancy extremely curious - a small portion of the population not only comfortable talking about but also challenging our institutions of governance without the input of the great majority, who are uncomfortable joining in on the dialogue. It was with this in mind that I decided to purchase The Unraveling of Representative Democracy in Venezuela. The purpose of the book is to describe the political atmosphere that existed in Venezuela in the 1990s which gave rise to a political leader such as Hugo Chavez. I had engaged in several conversations about these years and was eager to back up this new information with book knowledge. This book, which was published by The Johns Hopkins University Press in 2004, was edited by Jennifer L. McCoy and David J. Myers. However, each of the twelve chapters is written by an individual scholar and focuses on a different aspect of Venezuelan society. This provides a very comprehensive and informative review. 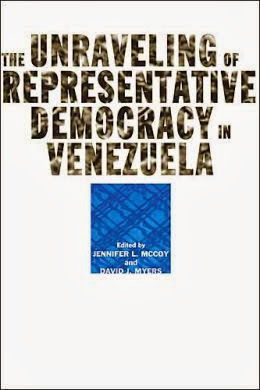 As this book deals extensively with democracy pre-Chavez, I would like to digress to mention a few facts regarding the state of Venezuelan democracy today. Firstly, a few facts regarding Chavez: He was elected President of Venezuela four times (1998 with 56% of the vote; 2000 with almost 60% of the vote; 2006 with almost 63% of the vote; and 2012 with 55% of the vote) before his death earlier this year. These elections are not contested by the opposition. While the percentages indicate that a fairly stable and strong opposition movement existed throughout these years, it is important to mention that it was almost impossible for these opposition parties to get financing through official means. Companies which gave money to the opposition were in danger of being expropriated. Following the death of Chavez, elections were held in April 2013 where Venezuelans were given the choice between Chavez successor Nicolas Maduro and opposition candidate Henrique Capriles. The results were extremely close and the opposition movement cried foul: Maduro with 50.6% of the vote and Capriles with 49.1% of the vote, with nearly an 80% turnout. The opposition suspects voter fraud and has filed a request at the Inter-American Commission on Human Rights to investigate election fraud. Needless to say, the democratic institutions currently in place in Venezuela have come under scrutiny – which makes this book even more relevant. To understand the rise of Chavez, it is important to understand how Venezuela fell from one of the most-lauded democracies in the western hemisphere in the 1960s to a divided land with a corrupt bureaucracy. As David Myers describes, “The unbroken thread of Venezuelan democracy dates from January 1, 1959 when Rómulo Betancourt took the oath as president… This fledgling political regime, known as Punto Fijo democracy, withstood challenges over four decades from neighboring dictators, leftist guerrillas, disgruntled military officers, and urban rioters.” (page 11) In the following years, the majority of the political sphere was dominated by one of two political parties – Acción Democrática (Democratic Action, or AD) and Comité de Organización Política Electoral Independiente (the Committee of Independent Electoral Political Organization, or COPEI.) During the 1970s in the midst of large oil gains, the Punto Fijo regime began to fall back on distributive policy and the politicians “favored policies that could be implemented by distributing new resources over ones whose implementation required redistributing wealth or crafting additional regulations.” (page 16) These policies were impossible to maintain during falls in the price of petroleum. Entrepreneurs: Some prominent entrepreneurs and leaders of businesses supported Chavez’s presidency in 1998 as a protest vote against the AD and COPEI political parties. “The post-1974 institutional collapse [of the Punto Fijo regime] can be explained by bad decision making, in particular by two costly mistakes… first, the misuse of revenue from the 1973 oil windfall; and second, mismanagement of the drop in oil prices after 1982.” (page 77) These mistakes led Venezuela to abandon the fixed exchange rate, fixed interest rates, and fiscal expenditures equal to fiscal revenues, which created a difficult business environment.